Nationality: American. Born: Winchester, Indiana, 19 September 1914. Education: Studied journalism at Franklin College. Family: Married 1) Patricia Doyle, 1942, one son; 2) Millicent Franklin, 1977. Career: Hired as assistant editor at RKO, where brother was employed, 1933; editor, from 1939; took over direction of The Curse of the Cat People , 1944; independent producer for Mirisch Corporation, 1959, and for Fox, 1963. Awards: Oscar for Best Direction (with Jerome Robbins), for West Side Story , 1961; Oscar for Best Direction, and Directors Award, Directors Guild of America, for The Sound of Music , 1965; Irving G. Thalberg Memorial Academy Award, 1966. The Film Director: A Practical Guide to Motion Picture and Television Techniques , with Richard L. Bare, IDG Worldwide Books, 1973. The Sound of Music: The Making of America's Favorite Movie , with Julia Antopol Hirsch, Lincolnwood, 1995. Interview in Directors at Work , edited by Bernard Kantor and others, New York, 1970. "Impressions of Russia," in Action (Los Angeles), July/August 1971. "Robert Wise at RKO," an interview with Ruy Nogueira, in Focus on Film (London), Winter 1972. "Robert Wise at Fox," an interview with Ruy Nogueira, in Focus on Film (London), Spring 1973. "Robert Wise Continued," an interview with Ruy Nogueira and Allen Eyles, in Focus on Film (London), Autumn 1973. "Robert Wise to Date," an interview with Ruy Nogueira, in Focus on Film (London), Autumn 1974. "The Production of The Hindenburg ," in American Cinematographer (Los Angeles), January 1976. "Robert Wise Talks about 'The New Hollywood,"' in American Cinematographer (Los Angeles), July 1976.
" Audrey Rose : In Search of a Soul," an interview with R. Appelbaum, in Films and Filming (London), November 1977. "Time and Again," an interview in Monthly Film Bulletin (London), November 1979. "An AFI Seminar with Robert Wise and Milton Krasner ASC," in American Cinematographer (Los Angeles), March 1980. "Robert Wise," an interview with L. Vincenzi, in Millimeter , March 1989. "Robert Wise. Part One: The Noir Years," an interview with C.J. Kutner, in Bright Lights , July 1993. "Robert Wise. Part Two: Life at the Top," an interview with C.J. Kutner, in Bright Lights , Fall 1993. "The Past Pays Off," an interview with Filmnews, July 1995. Interview with K.G. Shinnick, in Scarlet Street (Glen Rock), no. 25, 1997. Grivel, Danièle, and Roland Lacourbe, Robert Wise , Paris, 1985. Leemann, Sergio, Robert Wise on His Films: From Editing Room to Director's Chair , Los Angeles, 1995. Carr, Charmian, and Jean A. Strauss, Forever Liesl: A Memoir of The Sound of Music , New York, 2000. Stark, Samuel, "Robert Wise," in Films in Review (New York), January 1963. "Wise Issue" of Dialogue on Film (Washington, D.C.), vol. 2, no. 1, 1972. 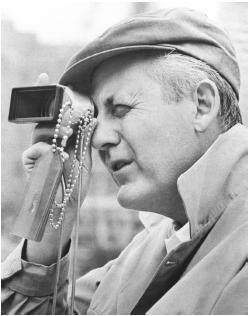 Stamelman, P., "Robert Wise and The Hindenburg ," in Millimeter (New York), November 1975. Guérif, F., "Nous avons gagné ce soir," in Avant-Scène du Cinéma (Paris), 1 March 1980. "Robert Wise," in CinemAction! (Toronto), January 1992. Johnson, S.R., "Epilogue:. . . and One Dead Woman," in Delirious , no. 2, 1992. Szebin, F.C., "The Sound of Screaming," in Cinefantastique (Forest Park), no. 4/5, 1997. In the early 1940s there were two young men in the editorial department at RKO who worked as editors on Val Lewton pictures: Robert Wise and Mark Robson. The latter was promoted to a full directorship of Lewton's Seventh Victim , a moody script by DeWitt Bodeen and Charles O'Neal about a cult of devil worshippers in modern Manhattan. Meanwhile, Robson's immediate superior in the editorial department, Robert Wise, got his first directorial opportunity when the front office grew displeased with Gunther von Fritsch, who was halfway through Curse of the Cat People , and dismissed him because he was behind schedule—a cardinal sin in the days of the studios. It was natural that Robert Wise, being the editor of Curse of the Cat People , should take over and complete the film, for only he knew the continuity of what had already been shot. Wise did so admirable a job that Lewton immediately got him assigned to his unit as full director for Mademoiselle Fifi with Simone Simon and The Body Snatcher with Boris Karloff. Wise had edited two Orson Welles films for RKO—two that became classics, Citizen Kane and The Magnificent Ambersons. After now being made a full director, he diligently went into an acting class because he felt that actors had a special knowledge and language of their own; it was the ideal way of seeing film from the actor's point of view. It paid off almost immediately; he got an assignment as director for The Set-Up , a realistic picture of the prize ring that made a top star of Robert Ryan and a top director of Wise as well. The Set-Up won him the Critics Prize at the Cannes Film Festival. In 1950 Wise was at Warner Bros., where he directed a distinguished mood film, Three Secrets , and went on to direct a remake of Edna Ferber's So Big with Jane Wyman, and The Desert Rats at Twentieth Century-Fox with Richard Burton. Executive Suite at MGM raised his status a notch higher, as did Tribute to a Bad Man with James Cagney. Somebody up There Likes Me was an excellent prize-ring picture starring Paul Newman, while Run Silent , Run Deep was a splendid submarine thriller for Gable and Lancaster. I Want to Live at long last won Susan Hayward an Academy Award as Best Actress for 1958. A couple of years later Wise shared an Academy Award as Best Director with Jerome Robbins for West Side Story. He returned to the moody horror film to make one of the most memorable of all time, The Haunting , which he also produced. He was director/producer again for The Sound of Music , a top box-office winner which won him once more the Academy's Oscar as Best Director, while The Sand Pebbles , with the late Steve McQueen, also earned him admiration. Through the wide range of his work, Wise proved himself to be a highly versatile director.